designing since early January, I decided I need a week of fun and silly time. 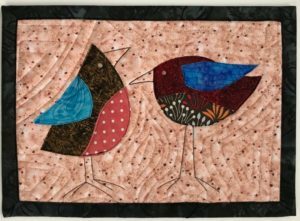 I created 10 small whimsical bird art quilts using rough edge applique instead of my usual piecing approach. I used my scrap print fabric pieces…Yeah!! No trips to the fabric store for these projects! I had made a few of these designs late last fall and taken them to a local arts festival. They were great hits! I haven’t had time to devote to these silly friends until this last week. I used up a large roll of Heat N Bond, on about 40 different fabrics for my pieces so I could mix and match AND have lots of fuse ready fabrics for the next time I want to make these. I laid out 10 different small bird art quilts. 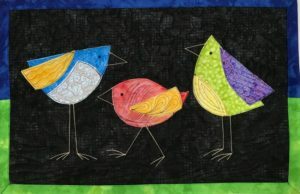 Then I matched up the bird groupings with background fabric. Finally, I fused the pieces to the background. That was the easy part! I created the quilt sandwich for each of the ten quilts and the fun of quilting commenced. Besides sewing the fused pieces to the quilt, I added a lot of fun free motion stitching to each bird plus the beak, legs and eyes which, all done on my sewing machine. 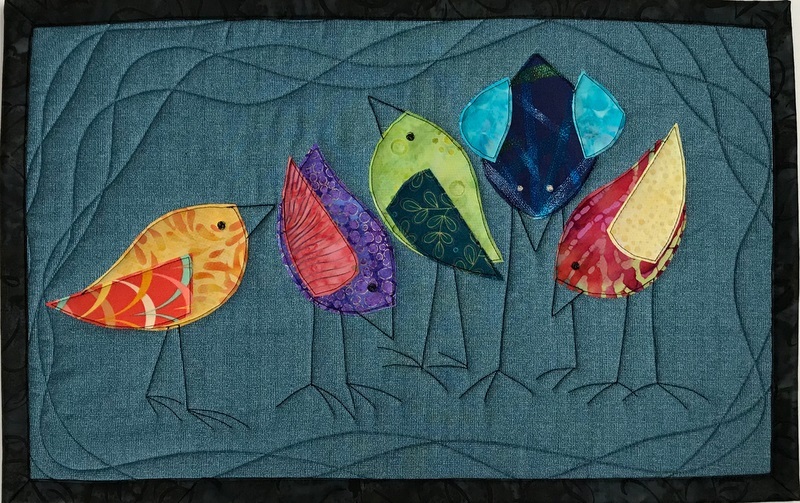 The last step was the binding of 10 small art quilts. Of course I could have simply put a black binding on all of them but what fun is that?! I did some crazy two color binding on a few and picked out some wild colors for others in addition to some black which was used on a few others. It has been a fun week of doing something a little different with my sewing machine and my creative energy.